Media Idols: Ann Curry, Barbara Walters, Kristie Lu Stout, Erin Burnett, Meredith Vieira and the late Peter Jennings. News Sources: CNN, BBC, NBC, The New York Times, Solar News, ANC, Rappler and Philippine Daily Inquirer. 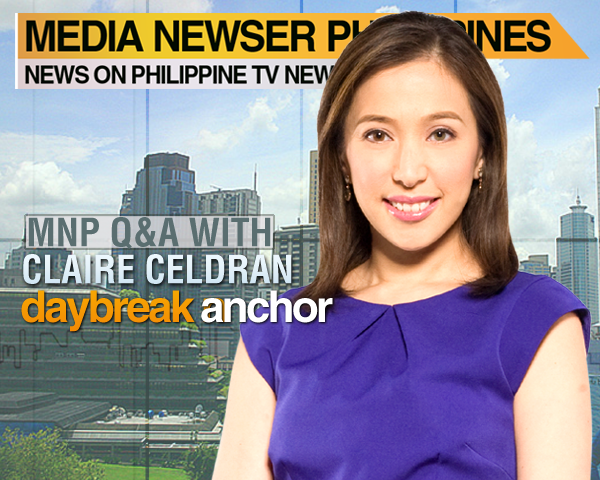 "I enjoy working for Solar News," says Claire Celdran, the newest co-anchor of Solar News' morning show Solar Daybreak. It is her first high-profile job since making a comeback in the local news business in 2011, and another milestone to her solid career as a broadcast journalist. Celdran began her career on ANC, then known as Sarimanok News Network, in 1999. Shen then left the country and moved to the U.S., where she would end up as casting producer for television productions like Queer Eye for the Straight Guy, The Bachelor, Elimidate and Cash Cab on Discovery Channel, among others. In 2007, she joined Ebru TV in New Jersey and made history as anchor of its evening weekend news program, and eventually moved on to anchor their weekday noontime newscast Ebru News, and the weekly news wrap-up The Weekly Report from 2008 to 2010. Morning TV's newest sweetheart was kind enough to grant us this interview where she talks about her stellar career, why she returned to the country, and her thoughts on the local media landscape, and many others. You’ve made a jump from ABS CBN News to Ebru TV and now Solar News. What made you decide to come back and rejoin the local industry? It was more of a personal choice rather than a career choice. After ten years living in New York, I decided to move back to the Philippines to focus on a family business and possibly rejoin the local industry. I heard about a new English news network that was Solar News. After learning more about Solar, I was convinced that it was the right fit for my style of delivering the news. Ebru TV is Ebru TV and that is no small feat. What was your experience with that network like? Anchoring for E TV’s international newscasts for three years was great. I had a chance to work with local veteran TV news anchors like Logan Crawford and Nicole Fox. Delivering world news expanded my mind to a new level. It gave me a better understanding of how countries and regions in the world operate and interrelate with one other. I was abreast with the latest on world leaders, the newest findings and studies in technology, science, and health. Each day at work was surreal because I got to do what I love to do and told the news that mattered not just to a few, but to the whole world. You started your career on ABS-CBN News as a weather anchor then later on as a news anchor. What was your experience with ANC like? Working in ANC was my first job out of college. I’ll never forget how ANC began. Back then, the network operated at the back of the Sky Cable office in JUSMAG. It was still called the Sarimanok News Network or SNN. It was a good time in my life. I was young and working with people like Tina Monzon Palma and the late Angelo Castro Jr., just to name a few. I consider those years my formative years and it was a wonderful experience. Working abroad and now back in the local industry, that gives you a pretty solid cred. How would you compare the broadcast news landscape in the Philippines and in the U.S.? The U.S. is a super power and the Philippines is a developing country. You can imagine how the issues may differ from each other. In the Philippines, each administration brings in a new style of governance and reforms. For example, the current administration put to the forefront corruption in government so the news will revolve on issues related to this. Another point worth mentioning is that news stories in the U.S. evolve much faster. When there is breaking news, the media is quick to develop the story and often times, the story will end at an appropriate time. The issue does not linger or drag on for months, like what we sometimes see here. An example is the Boston bombing incident. After the news broke, the story developed quickly until the suspect was caught and put to justice. So, do you plan to try it again someday or right now, Solar News is your priority? I enjoy working for Solar News. I was working abroad for 10 years so you could say I’m still in adjustment mode. For now, I am focused on rebuilding my personal and career life here in the Philippines. So far what’s the biggest story or in your case, stories, you have covered both local and abroad? In the U.S., the stories I enjoyed working on the most were- the Financial Meltdown on Wall Street, the U.S. Housing Crisis, Tobacco Regulation and Cyber Crimes. Locally, I took part in Solar News’ 2013 election coverage. I also reported for ABS-CBN, hours after the World Trade Center attack in New York City on September 11, 2001. You’re now anchoring Daybreak, and we have to say that you’re the perfect morning show anchor. You have that Katie Couric-Diane Sawyer factor in you. Smart, knowledgeable and let's face it, you’re good looking too. Do you love morning television? Thanks for the reference to Katie Couric and Diane Sawyer. Morning television is slowly becoming me. I have to admit, I wasn’t much of a morning person before anchoring Daybreak, but you get used to it after a while. In fact, I’ve come to like waking up early and getting a head start. Daybreak is pretty much different from mainstream morning shows wherein you have more news and less fluff. If you were to program the show, what do you want to tweak or are you satisfied with its current format? I have some ideas I’d like to possibly incorporate into the program. Since Daybreak is fairly new, we are open to suggestions. We are constantly thinking of new ideas and making sure we cater to our audience and their preferences. How would you describe your boss Jing Magsaysay? Jing Mag and I go way back. He was my first boss back in Sarimanok News Network, now known as ANC. He is professional, talented and a joy to work with. He is an inspiration to many and the main pillar that holds the network together. We have noticed you’re pretty good at doing interviews including one during the election coverage where you interviewed PPCRV chairman Henrietta De villa. What do you like more, anchoring or reporting? Both. I’m comfortable with anchoring the news, but from time to time, I also like going out to do reports. How would you describe your style, both as an anchor and a reporter? My experience in working for local news and news abroad has taught me how to merge styles. I can be diverse and capable of delivering news and information not only to the local audience but to the international community as well. In your more than a decade career in the business, what can you consider your best body of work? As a journalist, my best work would be the report I did on the U.S. financial crisis. While working on the story, I interviewed Wall Street analysts and the managing editor of the Economist, a world-renowned publication. The story focused on the events that led to the countries economic meltdown and how the biggest financial institutions failed. Do you watch the competition? Which shows outside Solar News do you enjoy watching? I don’t get to watch TV as much but when I do, I sometimes catch The Bureau on ANC with Karmina Constantino. When I find time, I try to watch the online newscast of Maria Ressa on Rappler. Are you more into the traditional media or now embracing the new media? I find new media to be fascinating. Sometimes I can’t keep up! But in this day and age, I feel like it’s a must, so I try my best to take part in it and be as active as I could. Which is more important to you: credibility or popularity? Top rating or highly praised? Part of my inspiration is my family so I would have to say both. Speaking of family, how do you juggle work and family life? Well, like the saying goes “life is a balancing act,” I make sure to find time for family without jeopardizing my responsibilities at work. Do you want your son or daughter to follow your footsteps as a journalist? If that’s what he or she wants to pursue, I will support them unconditionally. Although I think my daughter has the bearing of a Broadway performer [laughs]. I’m kidding, she’s only 6 so it’s too early to tell. What do you want to do next? What are your career goals? For now, I would like to focus on getting some of my ideas off the ground for Daybreak and then go from there. What’s the best advice you can give to aspiring broadcast journalists out there? Think outside the box! Find new and innovative ways to deliver a story. And most importantly be yourself, don’t try to be someone you’re not.